How Much Longer Will We Put Up With $100,000 Cancer Drugs? Of 91 new therapies approved for solid tumours between 2002 and 2016, the median overall survival benefit was little more than two months. Yet the annual price tag per patient now regularly exceeds $100,000. The spiraling cost of new drugs mandates a fundamentally different approach to keep lifesaving therapies affordable for cancer patients. As early as 2012, 12 of the 13 newly-approved cancer drugs were priced above $100,000 annually, and the situation has only gotten worse since (Light and Kantarjian, 2013, Mailankody and Prasad, 2015). For instance, the cost of the combination of nivolumab (anti-PD-1) and ipilimumab (anti-CTLA4) is priced around $252,000, exceeding the median cost of a US home ($240,000 in 2016). With a lifetime risk of developing cancer of close to 40%, the problem is clear. The pharmaceutical industry has traditionally defended these high prices by pointing at the high attrition rate during clinical drug development and the cost of large registration studies. If development cost would be a major factor in the pricing structure, a simple law of economics would have mandated a considerable reduction in price when the eligible patient population increases, but that has hardly happened. This is a recurring theme in pharma. For instance, trastuzumab was first approved for advanced breast cancer and later also for early disease (adjuvant) without a reduction in price. Healthcare payers should not accept this lack of price-volume relationship. Much has been written about the reasons behind the exorbitant drug prices and what to do about it. One recurring theme is the notion that the US federal government is prohibited by law from negotiating drug prices as a result of the 2003 Medicare Prescription Drug, Improvement and Modernization Act. Considering that Medicare and Medicaid spend $ 140 billion on medicines annually, this represents a serious impediment in driving down drug prices. 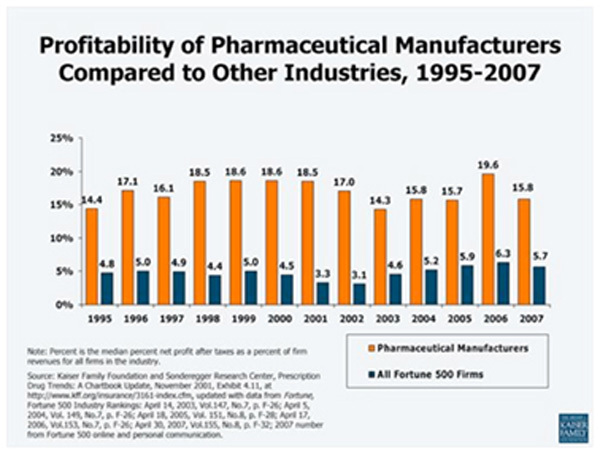 Lack of competition and a general absence of a connection between drug price, sales volume, and clinical performance are other arguments in the drug pricing discussion (Jaffe, 2015). Indeed, lack of competition and bargaining power made US prices of cancer drugs among the highest in the world, increasing by 10% annually between 1995 and 2013, far above the average inflation rate (Howard et al., 2015). While negotiations may bring prices down, a recent cost comparison in EU countries shows that the ability of individual nations to negotiate discounts is limited, most likely due to the modest market sizes of the EU countries (van Harten et al., 2016). Stevens CW1, Glatstein E. Oncologist. 1996;1(4):IV-V.
“. we must guard against the acquisition of unwarranted influence, whether sought or unsought, by the military industrial complex.” Dwight D. Eisenhower, 34th President of the United States (1953-1961). Farewell Address, January 17, 1961. If Ike were with us today, he might well expand his views on power and influence to include modern American medicine. The corporatization of health care in the United States has moved rapidly in recent years. 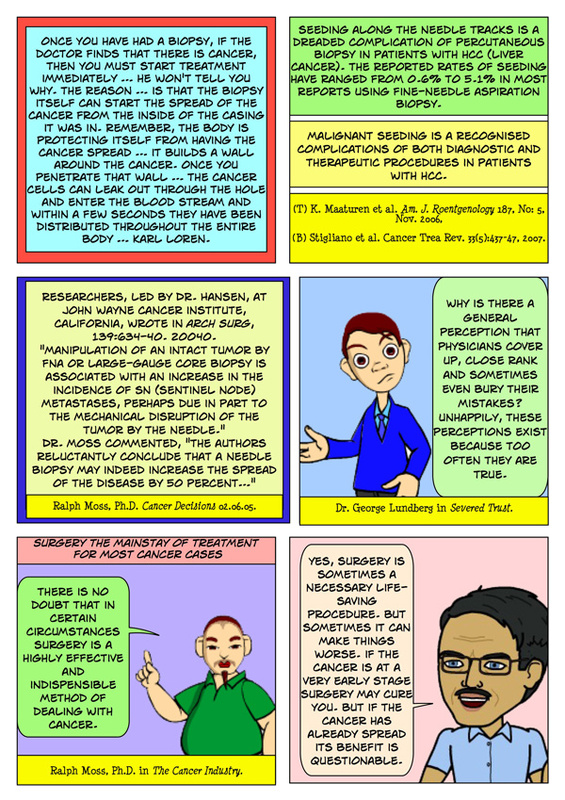 New developments in cancer treatment include expensive technological “bells and whistles” which physicians must ultimately evaluate objectively, despite lush advertisements from companies with obvious vested interests, and authoritative testimonials from biased investigators who presumably believe in their own work to the point of straining credulity and denying common sense. The 3-D image that was created by a computer may look beautiful (and cost accordingly), but it is hard to believe that it can fundamentally change the outcome of patients when it does not add any new data that bear on basic issues. Thus, new equipment will be exploiting issues of convenience, efficiency, and increased throughput (translate: economic improvement, not biological superiority). 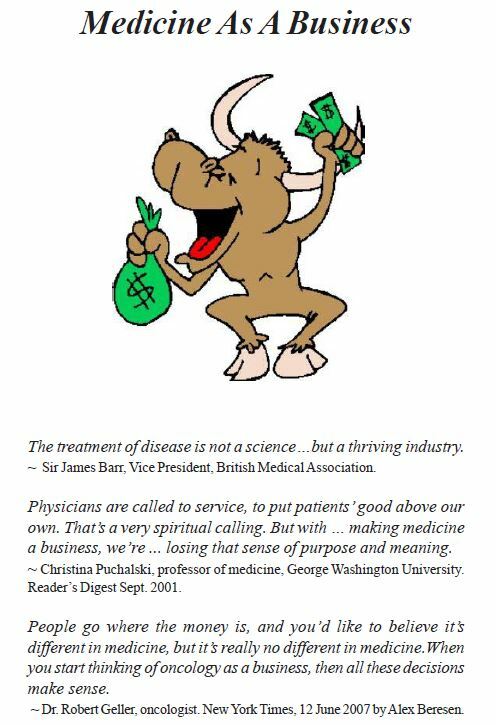 We must remember that every new therapy costs money …. Improvement in cancer cure rates has been frustratingly slow. We work against a clever, tenacious adversary – both in the clinic and in the corporate board room. It is our responsibility to tout our accomplishments, admit our failures, and provide progressively better basic and clinical research with an eye toward future improvements in outcome. We must not be seen as yet another special interest come to drink at the well of public spending, but as advocates for the public good. The prince and the pauper. A tale of anticancer targeted agents. Dueñas-González A1, García-López P, Herrera LA, Medina-Franco JL, González-Fierro A, Candelaria M. Mol Cancer. 2008 Oct 23;7:82. doi: 10.1186/1476-4598-7-82. Cancer rates are set to increase at an alarming rate, from 10 million new cases globally in 2000 to 15 million in 2020. Regarding the pharmacological treatment of cancer, we currently are in the interphase of two treatment eras. The so-called pregenomic therapy which names the traditional cancer drugs, mainly cytotoxic drug types, and post-genomic era-type drugs referring to rationally-based designed. Although there are successful examples of this newer drug discovery approach, most target-specific agents only provide small gains in symptom control and/or survival, whereas others have consistently failed in the clinical testing. There is however, a characteristic shared by these agents: their high cost. Anticancer Drug Development: The Way Forward. Cancer chemotherapy celebrated its fiftieth anniversary last year. It was in 1945 that wartime research on the nitrogen mustards, which uncovered their potential use in the treatment of leukaemias and other cancers, was first made public. Fifty years later, more than sixty drugs have been registered in the USA for the treatment of cancer, but there are still lessons to be learnt. One problem, paradoxically, is that many anticancer agents produce a response in several different classes of the disease. This means that once a new agent has been shown to be effective in one cancer, much effort is devoted to further investigations of the same drug in various combinations for different disorders. While this approach has led to advances in the treatment of many childhood cancers and some rare diseases, a plethora of studies on metastatic colon cancer, for example, has yielded little benefit. 5-fluorouracil continues to be used in trials, yet there is no evidence for an increase in survival. The lesson to be learnt is that many common cancers are not adequately treated by present-day chemotherapy, and most trials of this sort are a waste of time. Significant increases in survival will only occur if the selectivity of present-day anticancer agents can be increased or new classes of more selective agents can be discovered. Part 3: You should not continue with your medical treatments if you have run out of funds. SF had already spent around RM 150,000 for her treatment. She said her financial reserve was running low. My advice: You should not continue with your medical treatments if you have run out of funds. It does not make sense to give up half way through the treatment due to lack of funds. Think carefully. C: We are here not just to sell our herbs. We want to help people. We want to open their minds to new possibilities. We want them to think for themselves and not led by the nose — jumping into a bottomless pit and at the same time leaving a big hole in your bank account. So let me ask you this — what do you hope to get from rounds and rounds of treatment. I guess you want a cure, right? Unfortunately, from what I read and know, there is no cure for cancer. So first, understand that there is no cure for your cancer. Second, these treatments are going to bring you more sufferings. Third, you will have to spend a lot more money. So Ibu (mama) even if you undergo another round of treatments, I don’t see how you are going to be able to solve your problem. After the radiation and chemo, you needed an operation if the tumour shrinks. If the tumour does not shrink, you will go for more and more chemo. So your journey does not end yet. It may just be the beginning of another long journey. Please think carefully. Many Indonesians who came to see me underwent medical treatments without asking any question or much thinking. After undergoing the treatment half-way, they said: I have no more money. So I don’t want to continue with the treatment. My response was: Why are you so dumb. If you don’t have enough money to go through the entire course of treatment, why did you ever start with the treatment in the first place? There was this 35-year-old lady from Palembang. She had breast cancer and underwent a mastectomy. After the operation, she was asked to undergo chemotherapy, radiotherapy, and be on oral medication. The total cost of these treatments came to about RM200,000. I asked her: Do you have money to pay for this treatment? Her reply, No. Yes, I understand a 35-year-old cannot be expected to have RM200,000 in her bank account. So even if she wanted to undergo the recommended treatment, she could not. So, I said to her, It’s okay. No need to do the treatments. There is no point undergoing the treatment half-way and then stop! Did you understand what I am trying to tell you? C:. This is one important point I want you to consider now. In the next 2 days you need to go for chemo. You were told you needed 3 cycles initially. Okay, how much will that cost? Then calculate the cost of your stay in Malaysia. After that you need to go for an operation. What is the cost of that surgery? Husband: RM 25,000 for the surgery alone. C: Okay, RM 25,000 plus 3 x RM4,000 for the chemo and previously RM6,700 for the radiation. After the surgery you may need more chemo, and more chemo. Consider all these costs. I don’t know about your financial status. So you need to make a decision after careful consideration. Is the chemo and surgery going to cure you or bring your more sufferings? P: I don’t want any more chemo or surgery. I only want you to help me. The doctor said he would remove my right kidney together with the ureter (tube that carries the urine from the kidney to the bladder). C: What is going to happen to you after that? They will fix a tube. And one kidney gone. Do you really want to undergo such treatment? P: At first I didn’t want. C: What is the purpose of removing these? Think first! One important question to ask. 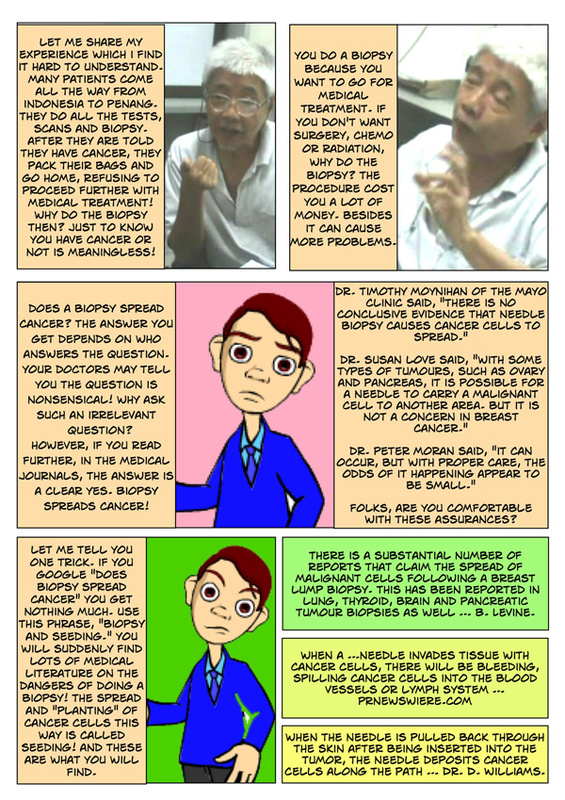 Will the doctor be able to remove all the cancer inside you? And after the operation it is all clean and the cancer would not come back again? Can surgery do that? 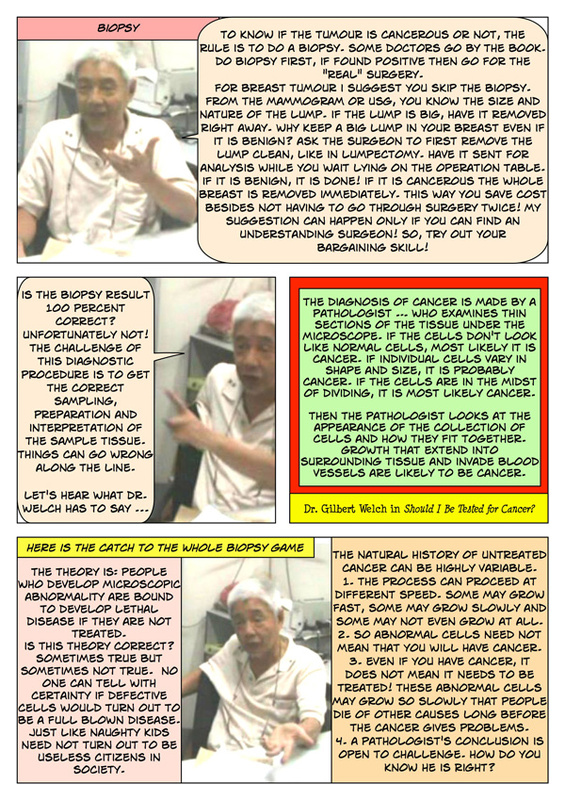 What happen if after the surgery the cancer becomes more aggressive and spreads more widely. Learn from nature — for example the ant’s nest. What happen if you take a parang and cut the nest into two? What if you leave the nest undisturbed? P: All the ants will spread out. C: I am not an expert in cancer but I use my head to think. And I also want you to think properly. Now, after you have just received 3 sessions of radiation, you had diarrhea. That bothered you a lot. You have not even started with your third rounds of chemo yet. You have already had 12 cycles of chemo and I don’t know what can happen to you if you have more chemo. You may end up dead? Again, if the tumour does not shrink this time around, you will need more and more chemo. When will that end? P: Before this, I don’t understand. I just accept what I was told to do. I don’t know that there is another way out. C: No, there is NO way out of this. P: I know. Everything is in God’s hand. By all means, sell your house or land to pay for the medical bills if the treatment is going to cure you! C: There is this young man who came to see me. His mother had lung cancer and had gone to China with a few of her friends for treatment. After the first trip to China, the mother ran out of money. She wanted to sell her house in which 5 of her children were living in. The son came to seek my advice. My answer: If you sell the house and your mother is cured, that’s okay. Worth the gamble. But what happen after all the treatments — money gone, and she is not cured? House gone, mother dead? And the children left out in the street without a home to go to. My advice was not to go to China for the treatment anymore. She survived 3 years after following our therapy. She had a normal life and was able to help her son in his motor-bike repair shop. Her friends who had money and continued with their treatments in China were ALL dead. C: I want you to think carefully. If I just want to sell you my herbs, I would have asked you to buy all that you need and go away. Why talk so much and so long? But the mission of CA Care is to help others. That is why I want you to go home and think carefully first. There is no need to take the herbs now. Why? Because in two days time you want to start with your chemo. Go and do your chemo first. Our herbs are no magic potion. Healing cancer takes more than just drinking herbs. Cancer is about human being — the need to change your attitude, life style and diet. I am not asking you not to go for chemo. I just want you to give a careful thought to what I have said. Husband: You have opened our minds. I begin to understand what is happening now. P: I did not understand all these before. BS is a 47-year-old male who was diagnosed with colon cancer in December 2014. He underwent a surgery in hospital A in Penang. It was a Stage 2A cancer. No chemo, radiation or medication was recommended. There were multiple nodules in both lungs. The largest one measures 1.2 cm. This is not see in the previous scan. There was a small cyst in segment 3 of his liver, measuring 1.1 x 1.1 cm. The above findings are consistent with metastases. BS was asked to undergo chemotherapy and also take the oral drug, Xeloda. He refused and decided to take our herbs and take care of his diet. Later, BS also told us that he went to Bali to learn how to meditate (baliusada.com), which I believe did him a lot of good. To monitor his progress, BS did a full blood test on 14 July 2016 in a private laboratory. The results was good. Alpha-fetoprotein = 2.1, CEA = 2.7, CA 19.9 = 29.6 and CA 125 = 6.2. Three months later, 18 October 2016, BS did another full blood test in a private hospital. The results was not good. His CEA has increased from 2.7 three months ago to 9.1. BS felt upset and disappointed. We discussed what had happened. For the past month, BS had been under extreme stress. His young nephew was robbed and murdered. Apart from that, he slacked on his diet. My advice to BS. Don’t worry so much for now. Try and relax and let’s see what happen in the next three months. We shall repeat the blood test. But to be sure, I suggested that BS repeat this CEA test with a private lab which we always send our patients to and which he went to earlier. So BS repeated the same CEA test the next day, 19 October 2016. Lo and behold, CEA from the private lab returned a normal value of 2.5, which is more than 3 times lower than the results obtained by the private hospital. I then suggested that BS repeat this same test in his hometown. The result was CEA = 8.4. So here it goes, three different labs came up with three different numbers! Now, what has gone wrong? And which result is the correct measure of the situation? What could have been the consequences of such mistake? No doubt about it, BS could have been told to undergo chemotherapy since the cancer has recurred. Or BS would have to do a PET scan to find out what had gone wrong. But, is it true that something had gone wrong? I have learned not to trust blood test results since years ago. This is because my patients make me see the reality of what happened in the real medical world. One prostate cancer patient went to three labs one morning and made them evaluate his PSA level. The results from the three tests were all different! Here goes the reliability of scientific medicine. Then, Jennifer regularly monitored her CA 125. The value was around 400 plus which was high. One day, she went to a well known private hospital in Kuala Lumpur and did her blood test. The result was shocking, her CA 125 shot up to 800 plus. Panic, she called me. This was what I told her. I think the result from that private hospital was wrong! Someone must have made a mistake!. To know the truth, repeat the test. Jennifer went to a university hospital. Her CA 125 was back to 400 plus — similar to the previous level. What can we learn from these episodes? Patients pay for the mistakes that other people in the hospital make! So patients, BEWARE. Just imagine, in panic Jennifer could has been sent for chemotherapy immediately because of the mistake made by someone in the lab. How serious and how often things like this happen is for anyone to guess! Indeed sad. Ponder the quotations below and always be on guard! The ability of drug companies to charge very high prices, even when most approved cancer drugs provide little gain for patients, drives much of the research, as desperate patients lead some governments and private insurers to pay whatever companies charge. The methodological weaknesses in oncology trials do not support such enthusiasm. Trials for cancer drugs were 2.8 times more likely not to be randomised, 2.6 times more likely not to use a comparator (single arm), …. If you don’t have the money to pay for a one day access to this article, try “googling” the subject matter, and with some luck you get a “free ride” and enjoy comments from various sources. From http://www.sciencedaily.com/releases/2015/05/150507135917.htm: Highly priced cancer drugs get rushed approvals despite poor trial methodology and little effect on the longevity of patients, cautions York University Professor Dr. Joel Lexchin in the School of Health Policy and Management. In an article in the British Medical Journal, titled “Why do cancer drugs get such an easy ride?,” Lexchiin and co-author Donald Light, a professor in the School of Osteopathic Medicine, Rowan University in New Jersey, note that accelerated approval and shortened review times also make it a smooth sail for cancer drugs. From: http://www.yourhealthbase.com/ihn260.pdf: How Effective Are Newer Chemotherapy Drugs? This editorial contains some extremely disturbing statistics and information the authors obtained from reviewing the chemotherapy clinical study literature and other papers over the last 8 to 10 years. Between 2007 and 2010, … almost 9000 oncology clinical drug trials were compared with trials for other diseases, the former were 2.6 times more likely not to use a comparator and 1.8 time more likely not be blinded (open to bias from the investigators) … this undermine the validity of the outcomes, it also reflect what regulators will allow. (In lay man language this means bad research. And the regulators — FDA, allows that!). The European Medicine Agency … found that new oncology drugs improved survival by a mean of 1.5 months and a median of 1.2 months. The 71 drugs approved by the US FDA from 2002 to 2014 for solid tumors have resulted in median gains in progression-free survival of 2.5 months and overall survival of 2.1 months. (Pay thousands of ringgit plus suffer side effects and you live 2.5 months longer? Not cured? As you told about this before you started paying though your nose?). Both the European and US regulators allow companies to test cancer drugs using a surrogate endpoint rather than survival or other more patient-centered outcomes. Tumor size is given as an example of an unreliable endpoint since it is highly variable in predicting overall survival. (In layman language the measure of trial outcome is not reliable. Just making the size of tumor smaller — or tumour shrinkage — may not mean anything. Surely it does not mean the cancer is cured! So, the measure of effectiveness is faulty). The authors term the approval process an “Easy Ride” and suggest that this serves both patients and research badly. 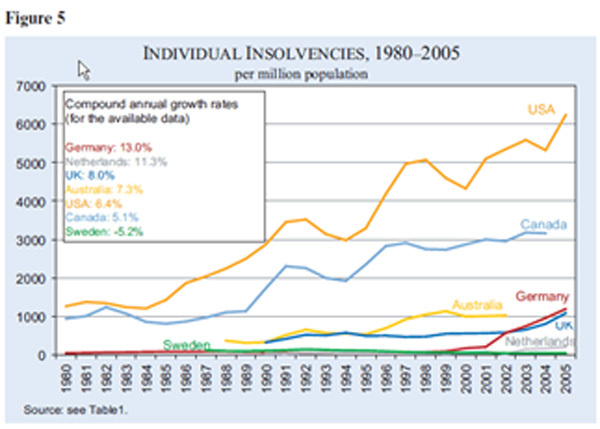 … generally priced so high that the choice is between bankruptcy or declining treatment except for the wealthy. The results discussed above are consistent with those presented in 2004 by Morgan et al14. Based on reports from Australia between 1992 and 1997, the contribution of curative and adjuvant cytotoxic chemotherapy to 5-year survival in adults was 2.3% whereas in the US it was 2.1%. These results suggest that over this period in these two countries chemotherapy made little contribution to cancer survival. (Yes, they tell you … chemo will give 60% chance, 99% chance, bla, bla …the Australian showed chemo is only 2 or 3% effective). BOTTOM LINE: When offered one of the new “wonder” chemotherapeutic drugs, it is important to ascertain the actual expected life extension in order to weigh this against the side effects. Trivial life extensions are sufficient to gain regulatory approval and allow patients to be told the treatment will extend their life. Unless carefully qualified, such an approach appears unethical. TT was diagnosed with cervical cancer. She underwent an operation to remove her uterus, ovaries and omentum. She was then referred to an oncologist who recommended both chemotherapy and radiotherapy. TT was not at peace at all about undergoing these invasive treatments but she did not have any other choice. She consulted with the oncologist three times and was assured that everything would be okay and that chemo and radiation were her only option — nothing else. During her second meeting with her oncologist, TT was told to pay RM 13,000 as a deposit for her radiation treatment. Someone told TT about CA Care. TT and her husband decided to forgo further medical treatments. TT went back to hospital and cancelled her appointment for her radiotherapy. What then happened to the RM 13,000 deposit? Can TT get a refund? Listen to this video. Gist of what TT and her husband said. They were angry. Why don’t you want to go for radiotherapy? We are still unprepared! For your RM 13,000 deposit, we could only refund you RM 4,500. The remaining amount is forfeited. Why must I lose that much money for just not wanting to go for radiotherapy? We have not started with any treatment yet? Okay, okay be patient. Let me consult. You have to pay for the oncologist’s fee — RM1,700 and the cancer hospital fee is RM 6,000 plus. The treatment has not even started yet. Why so expensive? It was only the nurse who made some markings. We did not even see the doctor yet. TT and her husband was referred to the finance department. They demanded to know: Why must I lose so much money just to cancel the treatment? Your hospital comes to Indonesia for publicity. What I can do is to go home and tell the press about this. Okay, you can have your RM 8000 plus, return me my RM 4,500. It is okay. I am not a poor man. I can come to Penang for treatment means I can afford it. The hospital called up the cancer hospital and after some discussion said: Hang on for 10 minutes. We have miscalculated. Question: Do you mean that by just asking a patient to go for radiotherapy the oncologist earned RM1,700 up front? Even when no treatment was given? When you saw the oncologist three times for consultation, did you pay him any fee? Yes, of course, we paid him RM 60 for each visit. So, this RM1,700 is over and above his consultation fee. The hospital earned RM 1,130 for putting marks on my tummy! Can the treatment cure me or not? What will that cost me in total — financially and emotionally? Don’t get caught up with the idea of wanting to only win. Know that you can lose the “battle” badly as well. In this case below: Imagine, daughter had an operation, (did the parents ask — can cure or not? can win? ), then she was paralyzed, hospital bills came to more than RM 2 million !! !, parents declared bankrupt (besides the frustration and heartaches). That is not wining at all. So patients, beware. The couple were earlier declared bankrupt after they could not pay the hospital RM2.35 million in unsettled medical bills. GEORGE TOWN: The Penang High Court has ordered the Penang Adventist Hospital (PAH), a private centre, to pay RM6,023,802 in damages to the parents of a 18-year-old paralyzed girl. The victim’s parents, Kee Boon Suan and his wife Ang Mooi Sim from Nibong Tebal, filed the suit three years ago. The High Court had ordered the couple in 2011 to settle RM2,350,013.85 due to the hospital in unpaid bills. The court order led the couple to be declared bankrupt. In his verdict on the medical negligence suit here on Tuesday, Judicial Commissioner Nordin Hassan said he found PAH and three doctors had committed medical negligence during a spinal surgery performed on Kee Jun Hui on June 4, 2008. He said the patient’s parents were also not briefed by the doctors-in-charge on the surgery details. He said the hospital was responsible for the negligence acts by the doctors-in-charge and nurses, who had breached their duties and duty of care to the patient. Nordin said PAH orthopedic surgeons Dr. Cheok Chee Yew and Dr. Wong Chung Chek neglected their duties after performing the surgery on Jun Hui. He said the patient had collapsed several times during the post-surgery recovery period while still under the hospital’s custody. He said anesthetist Dr. Patrick K. S. Tan neglected his duties and failed to instruct hospital nurses to attend to the collapsed patient after being informed of Jun Hui’s inability to move her limbs. M.S. Dhillon, Rhina Bhar and K.B. Karthi represented the plaintiffs while Mahindra Singh Gill acted for the hospital. All three doctors were represented by legal counsel J. A. Yeoh. Mahindra later told newsmen that PAH would appeal against Nordin’s judgment at the Court of Appeal. In 2011, PAH originally hauled Kee and Ang to court for failure to settle their medical bill for Jun Hui’s surgery. In 2012, the couple sued the hospital for medical negligence, as their daughter was paralyzed after the surgery. The hospital was named the first defendant in the suit followed by Cheok, Patrick Tan and Wong. And as anyone who’s been through it knows, the shock and anxiety of the diagnosis is followed by a second jolt: the high price of cancer drugs. 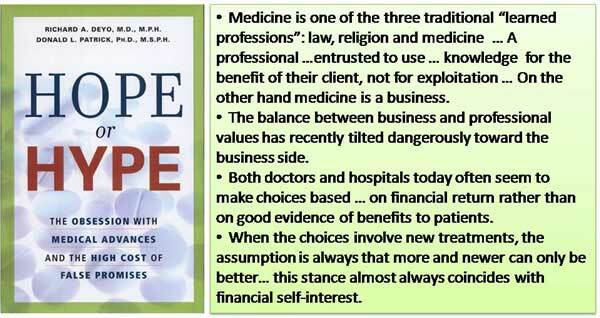 They are so astronomical that a growing number of patients can’t afford …..
Dr. Leonard Saltz: We’re in a situation where a cancer diagnosis is one of the leading causes of personal bankruptcy… We’re starting to see the term “financial toxicity” being used in the literature. Individual patients are going into bankruptcy trying to deal with these prices. Dr. Leonard Saltz: They’re priced at well over $100,000 a year … And if you figure one drug costs $120,000 and the next drug’s not going to cost less, you’re at a quarter-million dollars in drug costs just to get started. Dr. Saltz’s battle against the cost of cancer drugs started in 2012 when the FDA approved Zaltrap for treating advanced colon cancer. Saltz compared the clinical trial results of Zaltrap to those of another drug already on the market, Avastin. He says both target the same patient population, work essentially in the same way. And, when given as part of chemotherapy, deliver the identical result: extending median survival by 1.4 months, or 42 days. Then Saltz, as head of the hospital’s pharmacy committee, discovered how much it would cost: roughly $11,000 per month, more than twice that of Avastin. Another reason drug prices are so expensive is that according to an independent study, the single biggest source of income for private practice oncologists is the commission they make from cancer drugs. They’re the ones who buy them wholesale from the pharmaceutical companies, and sell them retail to their patients. Dr. Leonard Saltz: I don’t know where that line is, but we as a society have been unwilling to discuss this topic and, as a result, the only people that are setting the line are the people that are selling the drugs. Articles from the Internet: How Safe Or Unsafe Are Medical Imaging Procedures? In early May 2012, MS felt uncomfortable in her abdomen. She felt something moving inside. She went to see an internist in Jakarta. A blood test showed elevated CA 125 – more than 1400. MS was asked to go and see a gynaecologist. A ultrasound was done and the gynecologist told her to go home and pray. She was told consult an oncologist. MS went to see a doctor who treated her with semi—chemo injection. I was rather curious and enquired more about this treatment! This treatment was provided by a “retired” medical doctor who sees many patients a day. MS was given a concoction of “semi-chemo’ injection every day for two months. For her diet, MS was allowed to take only broccoli juice, egg white (albumin) – 12 eggs a day (4 eggs, thrice a day), banana and pears. MS felt better for the first month of treatment. But in the second month she felt the food rather boring. Her abdomen became bloated. In short, her condition worsened. MS and her elder sister (MM) came to a private hospital in Penang for treatment in mid-August 2012. She stayed two weeks in Penang and received two cycles of chemotherapy. She went home to Jakarta but did not get any better. After three days in Jakarta her condition deteriorated (drop!) She was admitted into a hospital in Jakarta due to low albumin. Her abdomen became bigger in size. On 28 August 2012 MS and MM came back to Penang again and was admitted into the same private hospital. And she has been in this hospital up to this day – almost one and a half months. While in Penang she received seven cycles of chemotherapy. According to MM, the family had already spent RM 100,000 but the patient was not getting any better – in reality MS’s condition had worsened. Since the current chemo regimen failed, the oncologist suggested switching to another regimen consisted of Caelyx and Topotecan. She was told that this would not cure her, but could prolong her life by about six to eight months. This information shocked MM and triggered here to try and look for another option. MM told me that after a short prayer that night she went off to sleep. The next morning she went to the internet and searched for kanker ovarium. This was her first attempt to find information for herself. There she found CA Care on the YouTube. MM came to see us on 16 October 2012. She brought along a stack of medical bills but not much medical reports! 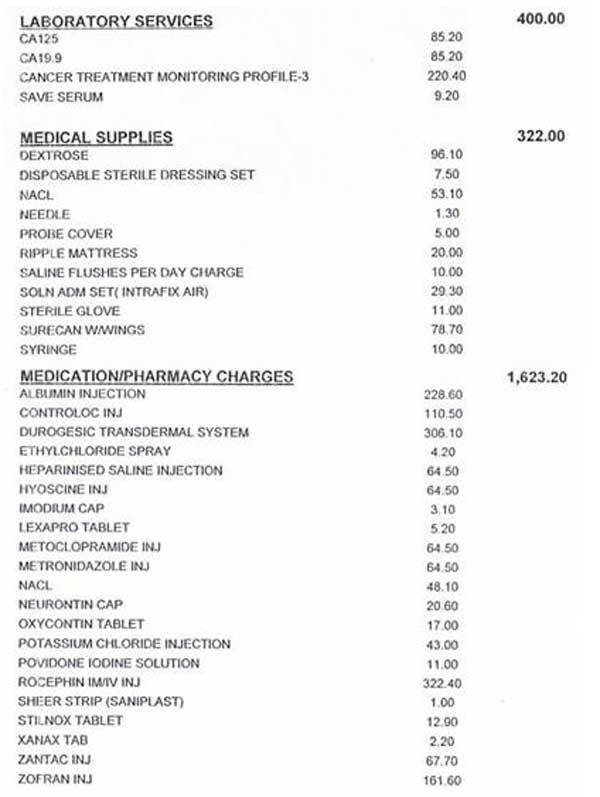 From her medical bills, I get to learn many things about staying in a private hospital. The total cost for a 41-day-stay in a private hospital in Penang is almost RM 86,000. This works out to about an average of RM 2,000 per day. 3. What Makes A Hospital Stay Expensive? The cost of a hospital stay consist of: room charge, doctors’ fees, nursing care, laboratory services, medical supplies, medication / pharmacy charges, procedures – dressing or nursing, X-ray and CT scan charges. On 18 September 2012 MS underwent chemotherapy. The drugs used were Carboplatin and Intaxel (generic Indian paclitaxel). And these are the drugs that matters – trying to “kill” the cancer. Take note that the cost of Carboplatin and Intaxel are only RM 363.30 + RM 363.30. 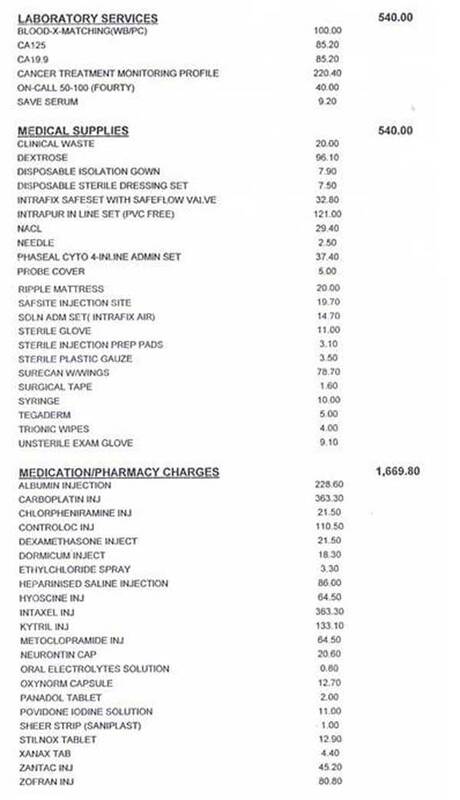 But the total cost for the day in hospital was RM 4,000.80. Just imagine, it would be most wonderful if Carboplatin + Intaxel were not toxic – treating cancer would be cheap and everyone could afford it! 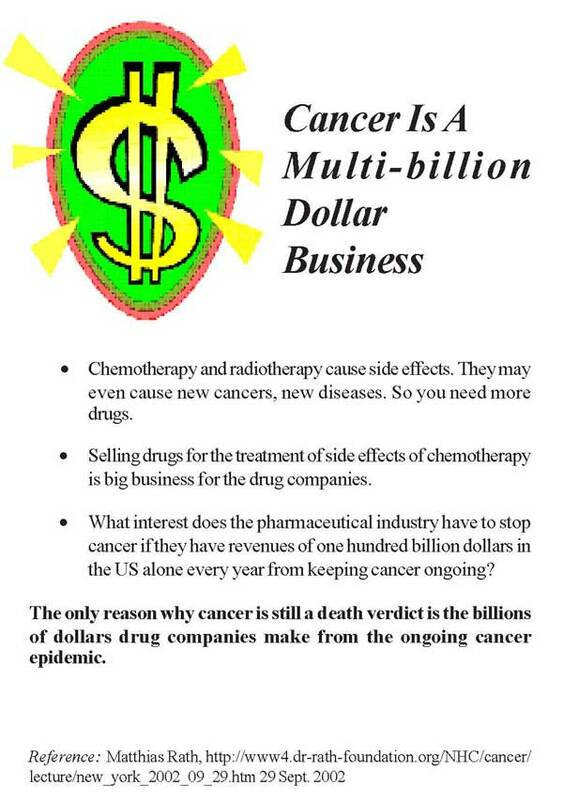 But the problem is, chemo drugs are toxic, i.e. poisonous! Because of that a lot of other drugs are needed to support and keep the patient alive! Study the details of the costs and types of drugs used for that day. 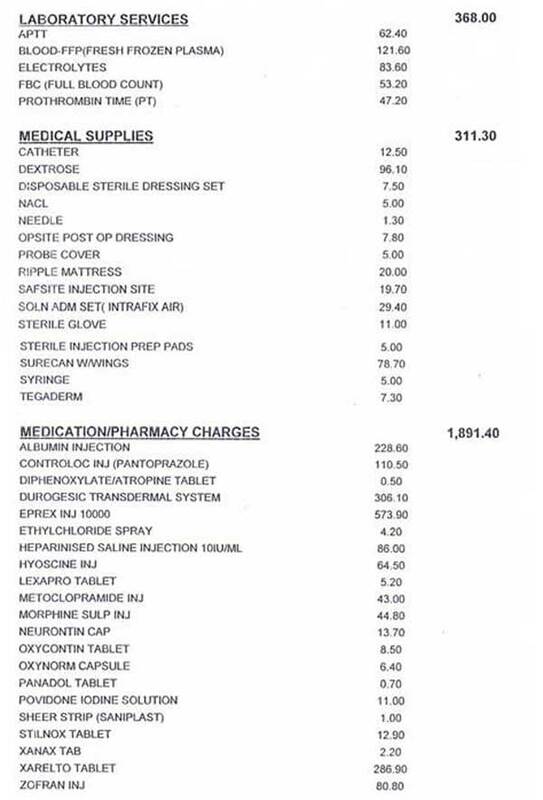 From the above, I learned that to administer a drug to “kill cancer” which costs only RM 363.30 + RM 363.30, patient had to spend more than RM 18,000 in the form of supporting drugs and services. 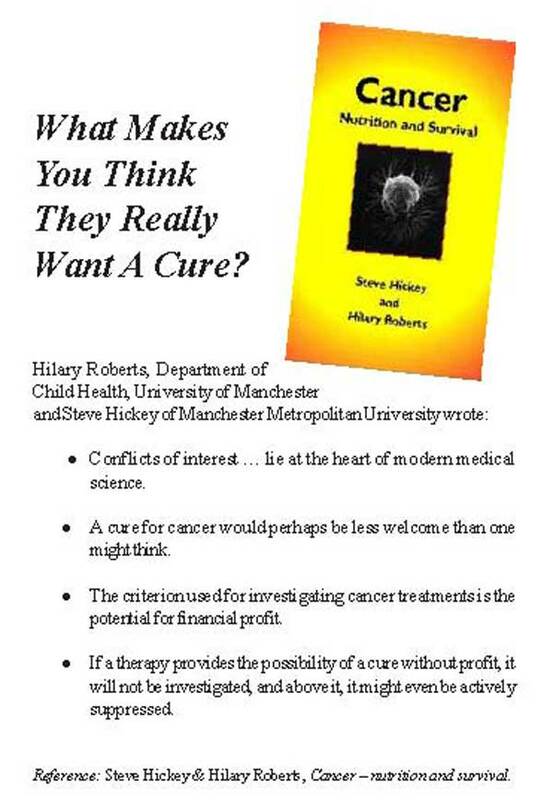 Again I say, how nice it would have been if that RM363 + RM 363.30-chemo-drugs were not toxic to healthy cells. Then we don’t need all those supporting drugs and don’t have to incur all those additional costs. 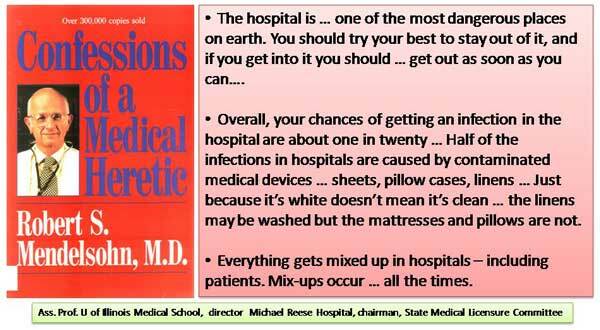 When you get into the hospital, know this …. Yoke (not real name, H-469) was a 54-year-old female. Sometime in October 2010, she had on and off pains in her abdomen. Later, the pains extended to her lumbar region. The pains deprived her of sleep. Yoke went to a private hospital for a checkup. Ultrasound, CT scan and blood tests were carried out. Blood test showed CEA = 38.3 (high); CA 19.9 = 40,003.44 (high); Total bilirubin = 4.6 (low) and GGT = 72 (high). For confirmation, a CT scan was performed the next day, 23 November 2010. The report indicated: “hypodense mass on the body / tail of the pancreas – measuring approximately 6 x 3 cm. The second hypodense nodule … is also seen more distally in the pancreatic tail. There are a number of hypodense lesions in the liver – the largest lesions are in segment 8, measuring 2.5 cm each. Other lesions are in the caudate lobe, segment 7 and segment 5. Impression: Carcinoma of the body and tail of pancreas with infiltration of the splenic vein, encasement of the roots of the portal vein and multiple hepatic metastases. Surgery was not indicated in this case, since the cancer had already spread to her liver. The only option left was to undergo chemotherapy. Yoke was told that she needed to receive seven weekly cycles of chemotherapy. With such treatment, Yoke was told there would be a sixty percent chance of suppressing the cancer (whatever that means?). The oncologist also said that the smaller tumours would not spread after the chemo-treatment. Pain in the abdomen and lumbar region. She had to take the painkiller, Tramadol. Unable to sleep if there were pains. She was prescribed Capsule A and B, LL-tea, Liver 1 and Liver 2 teas, Pancreas 1 and Pancreas 2 teas, and Pain Tea. A week on the herbs: Yoke felt more “cheng sin” (more energetic). Her sleep improved. In the first four days taking the herbs, Yoke suffered the healing crisis. She had intense pains. But the pains gradually subsided and by the fifth day the pains were gone. Two weeks on the herbs, 10 December 2010: Yoke informed us that she had totally stopped taking the Tramadol prescribed her doctor. She did not have any more pains but she continued taking the Pain Tea. Her sleep was good. Her appetite improved. Three weeks on the herbs, 17 December 2010: Yoke stopped taking the Pain Tea. And she did not suffer any pain. She said she was always felt hungry after taking the herbs. Our answer to this “problem” – go ahead and eat! Yoke appeared to be doing well with the herbs. She was then busy making arrangements for her daughter’s wedding. We did not get to see much of Yoke for some months even though we knew that she still continued taking our herbs. About six months later, May 2011: Yoke came to our centre and she was in severe pains. Why and what had happened? Yoke said her friend encouraged her to go for a PET scan in order to know what was going on inside her. After all she had been doing well. So Yoke went for a whole body PET/CT scan without seeking our advice. This procedure cost her RM 4,662. Immediately after the procedure, Yoke suffered severe pains in her abdomen and lumbar region. It was back to the same old problem again. Let Yoke explain what had gone wrong. Chris: You went to do a PET scan? Yoke: Yes and the doctor asked me to eat meat for two days. I was told not to eat rice, fruits, juices and vegetables. I must eat only meat, egg, mushroom and porridge. I was asked to eat these for two days before I went for the scan. Did he tell you why you need to do that? So that the pictures would come out clearer. Did you suffer after taking all these food? Yes after I took meat, I started to have pains – more pains. How much did you have to pay? I put in RM 5,000 and I got back RM 338 (so the cost of her PET scan was RM4,662). If I knew all these, I would not have gone for the scan. They asked me to eat meat for two days – damn it! I have a group of cancer friends. They too went for PET scan. They told me CT scan is not clear and PET scan is clearer – you will know if the cancer is active or not. So, you follow their advice? Yes, I was real dumb and went for it. There is no” meaning” for you to do that! As you had said. I had pains after that and they could not “repair” me. I had more pains and I was also not able to sleep. More problems for me. Daughter: They said the cancer had spread to the liver. Yes, we already knew that anyway. And they asked you to take meat? That was why the cancer became more active. They asked me to go for chemo. But the doctor said this was not going to cure me – only maintain. The doctor also said only 25 percent of patients who had chemo lived for two years. So I asked what happened to the remaining 75 percent – “went off”? When the cancer recurs, I would need to do more chemo. No, no – I told the doctor I do not want any chemo. When I told him that, he ignored me – not interested to talk to me anymore. Let me ask you this – let’s assume that you have two years to live with chemo, and you only have one year if you take herbs. Why one would you choose? I want to take herbs. May be I might just die sooner with the chemo. I told the doctor, “I might just die while undergoing chemotherapy.” He said, “No, no such thing. I would give you the drug bit by bit.” But I did not want to hear from him anymore. After the PET scan, Yoke had pains and these got worse by the day. She was unable to sleep or walk by herself, and became weaker. Her stomach was bloated and she was in severe pain. Finally she died not long afterwards. X-ray, CT scan and MRI show the anatomy and structure of the organs examined. In contrast, PET scan reveals the metabolic activity and function of the organs. So, X-ray. CT and MRI scans assess the size and shape of different organs in the body. They do not assess function. While a PET scan looks at the body or organ function. When we go for an X-ray, x-rays are generated from a machine and these rays go through our body and an image is formed on a film. In PET scan a radioactive material, called a radiopharmaceutical or radiotracer, is injected into our bloodstream. The commonly used radiotracer is fluorodexoyglucose (FDG). This is a glucose molecule which has been tagged with a small amount of radioactive element. The radioactive glucose is taken up by cancer cells. Tissues that are active accumulate a large amount of the radiotracer and they show up as “hot spots.” Thus, hot spots indicate high level of chemical or metabolic activity. Less intense areas, or “cold spots,” indicating a smaller concentration of radiotracer and less chemical activity. PET scan is now considered a new technology. It helps doctors to locate the presence of cancer/infection anywhere in the body. Because cancers are multiplying and require energy for growth, PET scan is designed to detect any mass that is growing fast. 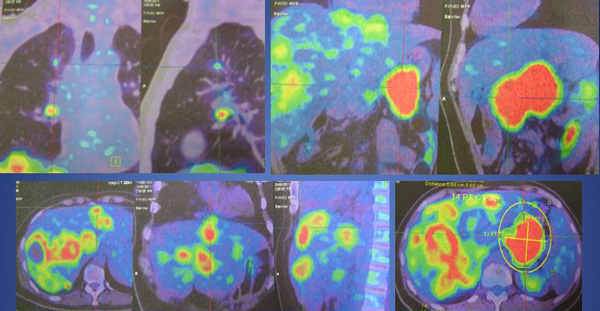 The PET scan can also detect the spread of cancer in other parts of the body. Do you learn any lesson from Yoke’s story? Yoke learnt her lesson the hard way. Unfortunately it was too late. But can you learn any lesson from Yoke’s experience? The doctor asked Yoke to eat meat, eggs, etc., so that the “picture” will come out clear and nice? Do you know the reason for this after reading the information above? Was he not trying to “wake up the sleeping cancer cells” to make good pictures? It is good for him but this caused more harm to the patient. What is the “useful” purpose of doing the PET scan anyway – in this case? To have supportive friends is great but some can lead you to your doom. So before you embark on something, read first. If you cannot read – ask those who really know! About a year ago, a lady from a neighbouring country urgently flew to see me. She came to discuss the CT scan results of a VIP (very important personality). The CT scan clearly stated that this VIP had tumours in his lungs and liver. His doctor suggested immediate surgery. This lady wanted my advice. Just to be on the safe side, I suggested that it might be a good idea to know the extent of possible metastases – if at all there is any spread – before undergoing surgery. Towards this end, I suggested that he goes for a PET scan. At that time, my impression was that the PET is the state-of-the-art imaging procedure. It is more accurate and reliable than the CT scan. After a few days, I was informed by phone that the PET done did not show any malignancy – no cancer! Nevertheless, I hesitated to believe the result. At that time, I “interpreted” the message differently. I had the impression that this VIP wanted to avoid any dealing with me and therefore the only polite “save face” strategy was to tell me that there was no cancer. So he does not need my help anymore! Some months later, I got to know through another person that this VIP had undergone a liver surgery. This planted the first seed of doubt in my mind about the reliability of PET scan. 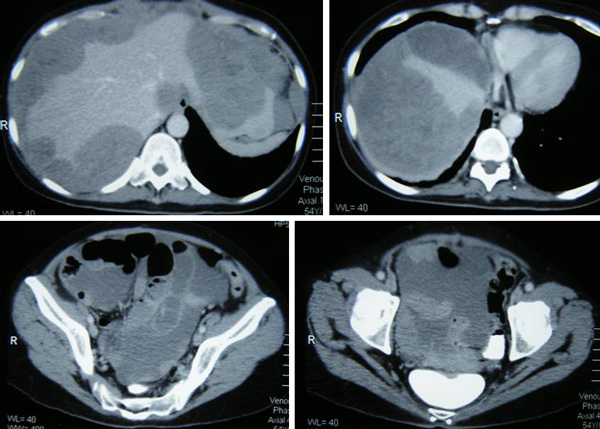 Three well-defined heterogenously hypodense small liver lesions in segments 2, 7 and 8. The largest in segment 2 measuring 0.7 x 1.0 cm. Foci of non-enhancing calcification seen in segment 8 with no mass effect, likely to represent old infection. Small, well-defined lung nodule seen in the anterior segment of right upper lobe of 0.3 cm in diameter. A small pleural-based nodule is also seen in the posterior segment of left lower lobe measuring 0.3 cm in diameter. Well-defined small sclerotic bony lesions see in at right acetabulum, left ilium and left neck of femur likely to represent bony island. Multilevel degenerative of the visualized spine. Impression: Known case of sigmoid colon carcinoma with liver and lung metastases. There is normal uptake in all the organs examined, in particular the colon, liver, lungs, lymph nodes, spleen, pancreas, kidneys, adrenal glands, brain and bones. There is no pleural effusion or ascites. Impression: No malignant lesion is detected. This was the second alarm bell. However, I did not take this episode to heart because the patient did not come to see me personally and I did not get to see the images of both the scans. As such I do not have any “solid” evidence to back up what I say – although I did have the faxed reports of both the procedures. The third alarm bell – on 5 February 2012. A man came to our Centre with the medical reports of his wife who has ovarian cancer. She underwent surgery – TAHBSO (Total abdominal hysterectomy with bilateral salpingo-oophorectomy) – on 15 September 2010. This time I had the opportunity to examine the images of both the PET and CT scans. Six months after the surgery, a PET scan was done at a private hospital in Selangor on 19 April 2011. Head – There is normal physiological localization of the FDG in the cerebrum and the cerebellum. The uptake and the distribution of the radiotracer in the posterior nasopharyngeal tissue, salivary gland and tonsils are within normal physiological limits. Neck –The thyroid gland displaces normal FDG upake. There is no FDG avid cervical lymphadenopathy. Thorax – Normal FDG uptake is seen in both breasts. There is no FDG avid axillary lymphadenopathy, bilaterally. There is no FDG avid mediastinal lymphadenopathy. Thre is no pleural effusion seen. Abdomen – There is no suspicious FDG avid lesion see in the liver. U[take and distribution of the radiotracer in the gallbladder, spleen, adrenals, pancreas, kidneys and bowels are within normal physiological limits. There is no FDG avid abdominal lymphadeopathy. Ascites is not present. Pelvis – TAHBSO noted. There is no definite abnormal FDG lesion seen in the pelvic floor and vaginal stump. There are some superficial subcentimetre size non-FDG avid inguinal nodes which are likely to be reactive nodes. There is no FGD pelvic lymphadenopathy. Musculoskeletal – There is symmetrical FDG avid activity seen in the acromioclavicular joints bilaterally, probably due to imflammation. There is no suspicious FDG avid lesion seen in the visualized skeleton. There is no evidence of residual hypermetabolic disease in the vaginal stump and pelvic floor. There is no evidence of hypermetabolic loco-regional or distant metastatic disease at present. Although there is no evidence of macroscopic disease at present, the presence of microscopic disease cannot be excluded. The above report was signed by the Consultant Nuclear Medicine Physician. A thick layer of lobulated parietal pleural masses are seen subdiaphragmatically, around the liver edges superiorly and laterally. It measures up to 6 x 3.5 cm around segment 8 of the liver and 4.5 x3.7 cm superior to segment 2. Intrahepatically, a hypoechoic nodule measuring 15 mm is noted in segment 3. There are also intraperitoneal mesenteric deposit, measuring up to 3.6 x 2.8 cm in the right lumbar territory. The uterus and ovary absent. Impression: Extensive intraperitoneal metastases with ascites. Significant progression of the metastasis is seen. Extensive lobulated hypodense mass noted in the peritoneum and mesentery of upper abdomen. The mass measured approximately 25 to 65 mm in diameter each. The mass creep in between the diaphragm and the dome of the liver with marked subcapsular compression of liver. Masses also noted in the lesser sac and the para-splenic space. Impression: In view of the clinical history, features are consistent with relapsed of carcinoma of ovary with extensive peritoneal and omental metastasis. Let me end with another story. There was this man who had stomach cancer. After surgery he came to seek our help and was started on the herbs. According to him, he felt good. He liked gardening and used to bring a lot of hot “cabai burung” whenever he came to our centre. He knew that I like hot chilly. One day this patient came and told us that he just had just done a scan and his doctor told him he had no more cancer – everything was clean. So he did not want to take any more herbs – after all the doctor said he was already cured! Although I did warn him that there is no such thing as a cure! No, his doctor’s words were more powerful and after all this was what every cancer patient wants to hear anyway. A few months later, someone showed me his obituary in the newspaper. Besides learning that he was dead, I also learned that this man was a Datuk – a titled, respected personality in the community. From the above stories, I learned that we can cause grave danger to patients by telling them things that they only want to hear. Or sending them for test that can give results that they are looking for – of course, the more high-tech the equipment involved, the more convincing it would be. So danger is not only confined to giving them the “wrong kind” of medication – the more toxic the more dangerous. In this case the lady patient above had a choice – to believe that she had NO cancer after her surgery. What a great relief and welcoming news when the high tech state-of-the art technology similarly confirmed this belief. The lady also had another choice – to believe that surgery did not in any way cure her cancer and actually there were a lot more of the cancer cells left behind after the surgery! High tech gadget was unable to detect that but intuition and plain old-fashion experience is able to decipher that possibility. Incidentally, while writing this article, I was also reading this humorous, oft-quoted all-time favorite book written by Dr. Oscar London, M.D., the pseudonym of an internist practising in Berkeley, California.